A rose is a rose is a rose. But is an Aster an Aster? Well, it depends. Globally, the plant world is in a tizzy, and that’s a good thing, says Kent Perkins, collections manager for the University of Florida Herbarium in the Florida Museum of Natural History. Plant evolution is robust just now; botanists are busy. 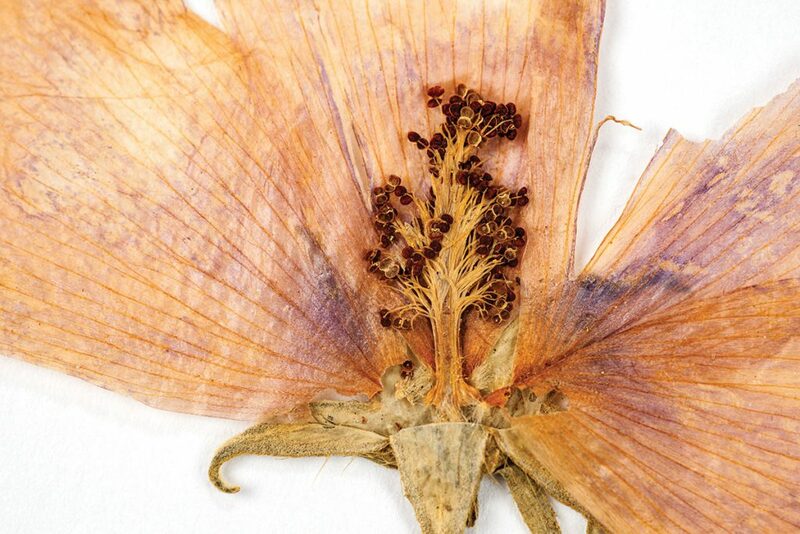 This botanical bustle was touched off in the last decade or so by two developments: genetic sequencing of plant specimens and digitizing herbarium specimen images and data and putting that information online. Genetic testing jolted the orderly world of herbaria internationally. With DNA, it turns out that some species weren’t what they were thought to be at all. An Aster is an Aster perhaps only until the genome is sequenced, reclassifying the plant into 10 separate genera. Digital databases have amplified this effect. Put up a photo of a plant, an orchid, for instance, and suddenly experts begin debating: Is it what it appears to be? Does it belong on this branch of the family tree or another? Is there an evolutionary detour in the shape of the flower? Does it need a new name? The collection of Civil War Gen. Edmund Kirby Smith, dates to the 1800s. It was donated to the UF School of Pharmacy in 1932 and turned over to the Herbarium in 1972, when work began on restoring, preparing and cataloguing the collection. Much work remains on the mosses and lichens. Perkins goes to a cabinet and pulls out a specimen, carefully mounted on archival paper, its collection data meticulously recorded. First one name appears, then another, and another. For one orchid, Spiranthes x ichetuckneensis, there are a half dozen annotations, its name changing six times. 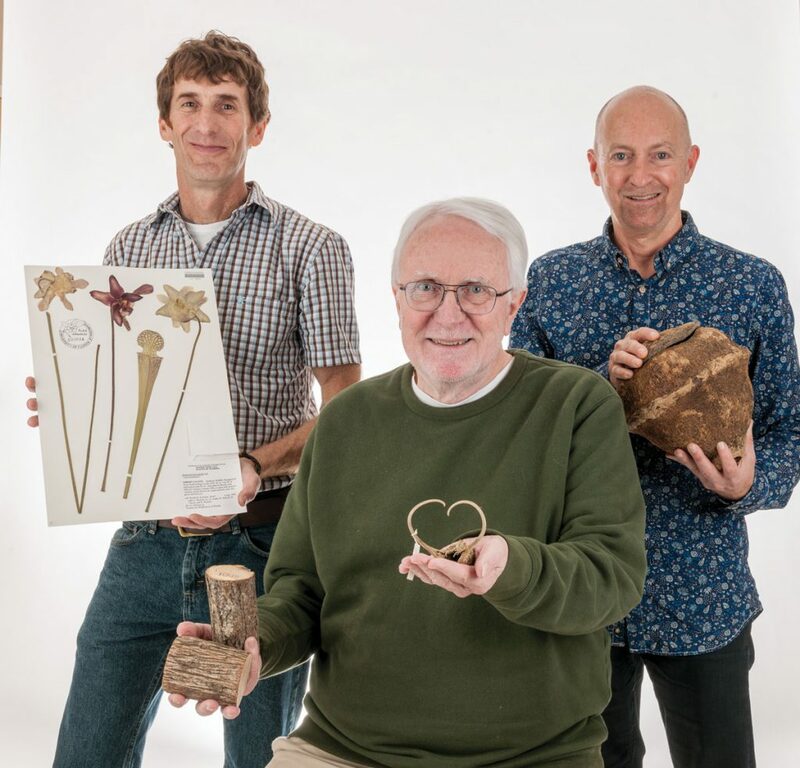 Such experiences are so commonplace that many plant genera will take years to sort out — even as many others have not been described at all — but that makes collections like UF’s, at 470,000 specimens and counting, all the more important, Perkins says. 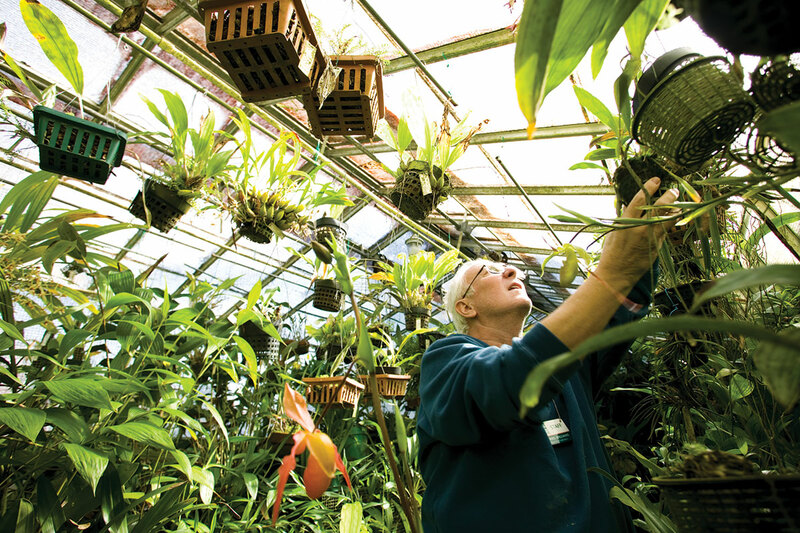 Herbarium Keeper Norris Williams says his own specialty, orchids, demonstrates just what a vast undertaking plant taxonomy can be. The orchid family has more species than mammals, birds, reptiles and amphibians combined, with 28,000 orchids worldwide. Florida is botanically rich — only two states have more species — and the herbarium is the repository of that richness. The herbarium has vouchers that document that a particular plant — or plant fossil or seed — existed in a particular place at a particular time. Using the vouchers, a scientist can study habitat, chemical composition, seasonal variation, morphology. A voucher can also be tied to DNA, for studies of plant evolution. Type specimens are important, too, because they serve as the standard for recognizing each plant species. The herbarium processes about 3,000 specimens into its collection each year, and just as plants are variable, so are collection data. Collecting a plant is more than just plucking it from a landscape. For the specimen to be useful, the collector needs to note the location as precisely as possible, when it was collected, and as many details as possible about the environment: was it disturbed, what else was growing nearby? Sometimes a researcher who is just after molecular information is less attuned to label data, perhaps relying on GPS. Williams notes that the most useless location he ever encountered was on a pressed specimen labeled “Amtrop.” The collector might as well have left the specimen in the American tropics. The herbarium recently has been working on incorporating a donated collection from Angus Gholson. Gholson was a 1948 UF forestry graduate who went on to work as a land manager near the Jim Woodruff dam on the Apalachicola River, near Chattahoochee. His collection, about 18,000 specimens, is important because the watershed of the Apalachicola includes many rare and unusual species, some important in erosion control along the riverbanks. 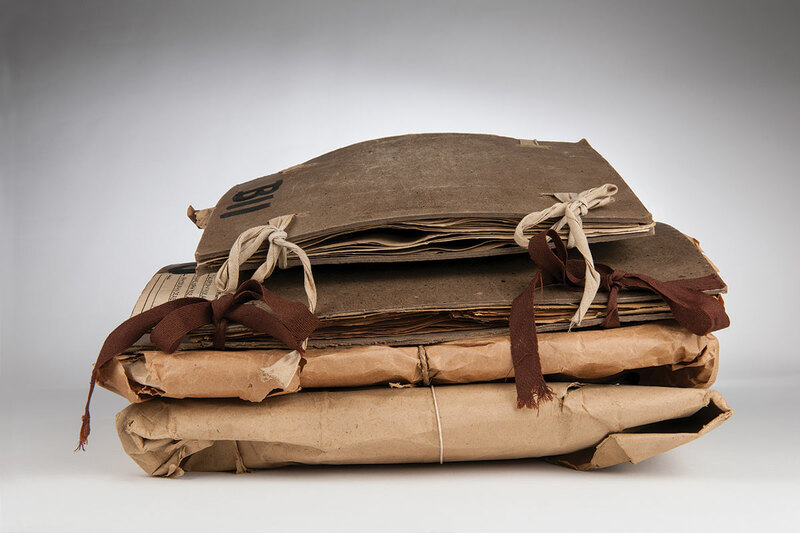 The Gholson collection, like all new arrivals, was quarantined for two weeks in a freezer at 0 degrees to be sure it was pest-free before taking its place in the herbarium. Another project, two years of collecting in UF’s Ordway-Swisher Biological Station, likely makes its nearly 10,000 acres among the best-documented chunks of Florida, with the addition of high-resolution field photographs. Ordway-Swisher is not immune to the botanical flux, Perkins notes, and he is braced for the day when a specimen is renamed and all the associated online records have to be changed, too. Getting everything online is a complicated workflow. In SERNEC, the Southeast Regional Network of Expertise and Collection, over 100 herbaria are represented, all with different standards for labels and data. Digitizing is an important window into collections worldwide and UF’s own, “but it may kill us in the process,” Perkins says wryly. Besides research, the herbarium collections are used in a practical way, says Frank, who fields dozens of questions a week about plant identification. With plant names constantly changing, he uses the herbarium to keep up, identifying up to 1,000 plants a year for everyone from a curious homeowner to a professional land manager. For land managers, invasive species are a key concern. Frank uses herbarium records to understand the history of a plant’s introduction to Florida and the rate and extent of its spread. On all agricultural fronts in Florida — citrus, pasture, turf grass, ornamentals, aquaculture — invasive plants have a huge impact, Frank says. To find out how quickly an invasive plant is spreading, botanists rely on herbarium voucher specimens and field observations. Norris Williams moved to Florida and became a world-renowned expert on orchids. He does not grow them; there is beauty enough in their pollination systems. The herbarium also has digitized Florida’s endangered and threatened plants. The Florida Department of Agriculture and Consumer Services lists 542 Florida native plants as threatened, endangered or commercially exploited (61 are also federally listed). The ability to identify and recognize these plants is the key to discovering them in the landscape and then protecting them. Endangered species can only be collected under permit, so the herbarium specimens become more precious over time. Other collections include insectivorous plants and selected poisonous plants, which prompt a few calls each year, says Frank, who works with Florida Poison Control in his public outreach role. Florida’s oleanders, beautiful and poisonous, prompted the strangest request from the public. A chance encounter on a Friday afternoon in graduate school sent Williams to Florida. He was a student at Washington University in St. Louis, sharing a beer with some classmates, when they recommended a tropical ecology class. His interest piqued, Williams took it, and he was smitten, particularly by the orchids. Williams moved to Florida and became a world-renowned expert on orchids. He does not grow them; there is beauty enough in their pollination systems. In 1981, he became the keeper of the herbarium. In 1997, when the herbarium moved from Rolfs Hall — out of the bay window on a lift, since there was no elevator — Williams figured the space would last 20 years. “Ten years after we moved, we were nearly full,” Williams says. Initially, the environmental conditions caused issues with beetles, book lice and mold, so a new air conditioning unit was installed just for the herbarium, keeping a constant 68 degrees and 45 percent humidity, perfect for the herbarium but not for every other collection. The unit was so expensive, Williams and Perkins figure they are in place in Dickinson Hall for a while, nipping and tucking to find more space. Even in the cool air, aromas remain. The collection has specimens that date back to 1840, obtained in a trade with the British Museum, and when the older cabinets are opened, the scent of mothballs drifts out, even though mothballs are no longer used for pest control. The mint collection smells sweet, viburnum like dirty socks. “Someone had valerian out the other day, and for a minute I thought ‘What is that awful smell,’” Perkins says. Wood specimens are part of the collection, too, orderly blocks in rows in drawers. Williams says he knew a UF graduate student who had a piece of charcoal she could not identify, so she sent it to the Smithsonian. The Smithsonian sent it to the U.S. Forest Service’s lab in Madison, Wisc. There, they shipped it back to UF. “They told her they send all charcoal specimens to the University of Florida,” Williams says, noting that UF has the fifth largest wood collection in the U.S. Lesson learned: check the home herbarium first. Botany may be bustling, but the UF herbarium is keeping pace.